A couple of days ago Rob Hopkins, the founder of the Transition Towns movement came to Vienna for a lecture and workshop. All of it organized by the Regional Centre of Expertise on Education for Sustainable Development (RCE) Vienna at the University of Economics and Business and hosted at the office of Global 2000, the Austrian branch of the international environmental NGO Friends of the Earth. The afternoon was dedicated to making Vienna imaginative again. Sometimes we just need to bring the imagination into the room through a game. So Rob Hopkins started out by by giving participants 5 minutes to imagine new ways to use a very, very common object of your everyday lives: a paper coffee cup. Without any rules or any correct answer. We have a problem, says Rob Hopkins. Why? Because we don’t have stories about a world of minus 50% emissions. What would that world smell, sound or look like? According to him we need imagination, not innovation. Imagination is “the ability to see things as if they were otherwise“. Rob Hopkins affirms that talking transition isn’t “about utopian stories, but about what it would be like to get there“. As I understood it, we really need to picture the possible world ahead after a big transition. And art can help in that. What are transition towns actually? In his own words “movements of communities reimagining and rebuilding the world”. Transition towns give people the experience in their everyday life of what a future world would look like. In practice, people get together in their communities and organize more sustainable lives by farming own vegetables, producing their renewable energy as a coopeartive, taking back the streets from cars or introducing a local currency. In the example of reclaiming the streets for a day by rolling out grass, meeting-cooking-playing outside, people changed their perception from if something will happen to when it will and came up with new ideas through it. Because they saw and felt the reality of it. Transition initiatives work best in smaller towns. The picture shows the art project Art Angel run by and for people with experience of mental health difficulties in Dundee, Scotland. It has been transforming the lives of many, creating a safe space of community and teaching skills. Maybe we need more of such places in an inclusive society that values each person as they are with their strengths and weaknesses. Right now we have a problem. We live in the time of a creativity crisis. Many people in the social and environmental movement want to help others to imagine a better world, while they don’t really know how to go about it. A graphic novel is a work of either fiction or non-fiction in comic-strip format. In the collaborative graphic novel project Dreams of a Low carbon future by the University of Leeds, 370 school children from diverse backgrounds were invited to explore their vision for a sustainable future society together with artists. You can download the novel here to spark your creativity and read it with kids. So is art a vehicle to change and save the world? Probably few artists would assert that. Graphic novelist Philippe Squarzoni, author of Climate Changed: A Personal Journey Through the Science doesn’t believe that a book or film could ever change things by itself and takes Al Gore’s film as an example. What striked me was Rob Hopkin’s mention of Quentin Blake, British cartoonist and illustrator, and author of the iconic pictures accompanying Roald Dahl’s books. One of his many works is the depiction of motherhood, the connected FEELING between mother and newborn child. This reminded me how powerful art is, if it just manages to transport the deepest feelings. Maybe in a culture that has been losing its attention span it needs art, from literature to video projects, to capture attention, create meaning and make people care. And yet, with this article affirming that shrinking attention spans as well as the bad memory of goldfish are a myth, I realize again that we do like to tell simple stories and that societal problems deserve to be be talked about less superficially. Students actually do have the ability to focus on a project for hours when it feels meaningful and they have time & space to accomplish it. What I guess is real, true problem is that “we are forever elsewhere”, living less in the present. And maybe thus caring less. From my experience I can say that art brings people to feel present in the moment. 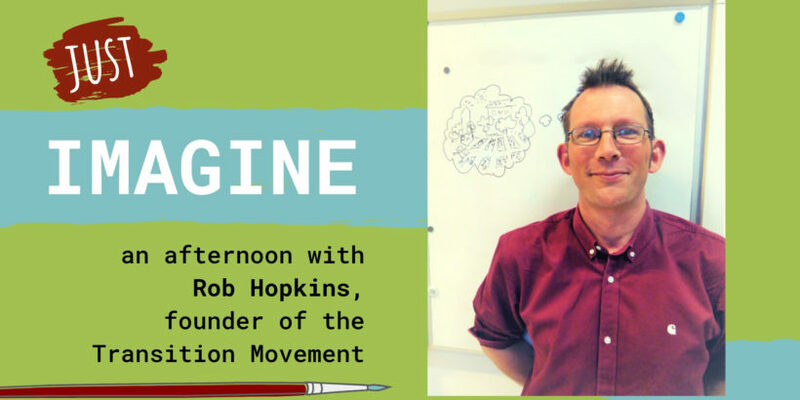 So whether our attention span has eroded or not, do you think we have been losing the ability to be imaginative as Rob Hopkins claims? It seems to me that the feelings of fear we have in our society that he mentioned are more of the culprit. As a workshop today taught me, another problem is our generally low emotional intelligence and lack of understanding of feelings like fear as sources of strength and creativity. Or let’s say childhood for change. Here Rob Hopkins asked the question what it would be like if school nurtured young people’s imaginations. He mentioned the innovative Reggio Emilia approach from the homonymous region in Italy to preschool education. It is based on principles like creating a space of collaboration, communication and exploration, with authentic materials and tools. Projects emerge based on the children’s interests with artists as mentors, instead of being planned, inquiry is king and children can express themselves in hundred languages – from modelling to music. Then there’s the school in São Paulo, Brazil, with a large circus tent in its middle and where kids design their own lesson plans. And the Red House, or Plymouth School of Creative Arts in England with big open floors and open classrooms, science and design labs, a recording studio, theatre or ‘making’ workshops. He also talked about how killing children’s imaginary friends, by telling them off for going on with that game, is a really bad idea and how play teaches children to take risks. What he says is a quality today’s and future adults desperately need. In Austria, one of the main initiatives on a different kind of education is the platform Schule im Aufbruch, driving change towards schools valuing the strengths and weaknesses of every child and helping them develop their full potential. Rob Hopkins also mentioned the figure of Antanas Mockus, former mayor of Bogotá, to illustrate how important play is in successful politics. The Colombian mathematician, philosopher, and politician became famous for employing mimes instead of corrupt police to make fun of traffic violators and putting in place a Night without Men for women to go out in the city undisturbed. The actions of the mimes were televized to reach more people, spark a public debate on socially acceptable actions and drive behavioral change. Do you think a similar method has potential for changing behaviours on sustainability outside the Colombian context? He used playful, theatrical campaigns, games and symbols in his attempt to create a civic society through a deliberate “anti-politics” and rejecting traditional forms of instititional enforcement. The mimes were a success, but what probably made his time in office successful were the all the other policies he introduced and the fact that more people trusted him, because of his background as a professor. For example, he introduced a “plus value tax” that people payed locally if they wanted infrastructure like a road to be developed. He also launched a campaign that almost halved the murder rate, cut water usage of the population by half through appearing half naked on television and turning off the water while soaping and creating a network of libraries based on trust, without any registration. “What if leaders practised the cultivation of imagination” instead of innovation strategies? Any way it would make sense in the first place and be possible to put play back in Austrian and European politics? Rob Hopkins also talked about local currencies. Above all, the Totnes pound he initiated – a complementary currency in Totnes, UK, working alondside the normal pound to support support local businesses and encourage local trade and production. So the idea is to thus keep the money circulating in the local economy as long as possible. As he mentioned at a conference on blockchain and sustainability the next day, the Totnes pound will be stopped this year because of its low circulation. So he admitted that he doesn’t have all the solutions. While he talked about how printed notes encourage storytelling and community, other speakers discussed how the future lies in electronic money. There a representative of Qoin, social entreprise introducing locally owned and run digital currencies, talked about how most local currencies don’t survive EU- or other external funding and would actually need a good business model, including different types of players. Having digital currencies you automatically have a lot of data from transactions that you can analyze to measure your impact and find faults. He recommended the free book People powered money – designing, developing and delivering community currencies as the nr.1 read on the topic. In the workshop, participants then came up with many ideas on how they imagined a better Vienna. The proposals ranged from legalizing street music everywhere, removing stretches of concrete, replacing them with pebbles and designing the city as a bit of a playground; covering walls of public spaces with green moss graffiti, prohobiting all private cars, creating hotpots – cooking zones on the streets and open to all – , co-designing urban planning between the Municipal Department for Urban Development and Planning and youth, more skillsharing to creating one central map of all sustainability-related initiatives in Vienna. David Steinwender from Transition Austria among his other initiatives addressed the need of bringing together the Transition Office Vienna and universities to get students and staff involved in practical transition projects. And why not make school trips to the climate camp the standard instead of skiing courses? Or start a campaign putting up large posters to help people imagine a better world while hurrying to their next appointment? Or what about adapting the Viennese initiative of Zetteldichter – poets putting up their writing on small slips of paper around the city – to sustainability? My biggest personal concerns were: creating a plattform to collect best-practices & learnings of projects and thus bringing organisations together, pushing e.g. Schule im Aufbruch to become the one central platform for future school education and telling the story of the Vienna in transition. Both online integrated in a mapping platform as well as offline. To create directions and info plaques just as wen know them from historical sites and trace a network routes through the city. make change visible, because this is what matters. cover picture: (c) klimareporter.in. The thought bubble shows Rob Hopkin’s vision of a transition town with renewable energy and lots of green.